I laughed when I read the comment. That campaign was almost 30 years ago! It must have stuck. 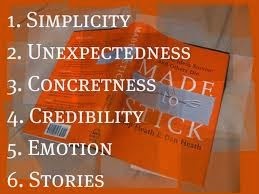 That reminded me of the awesome book Made To Stick by Chip and Dan Heath. Over the course of my career in public relations and association management, I’ve had the opportunity to be part of “sticky” campaigns or programs that yielded meaningful results. In the early 1980s, the American Soybean Association advocated a formula to establish a “federal loan rate” for soybeans. During debate (with Congress and others) about establishing the new rate, that formula called for the loan rate to be $5.02. During a policy meeting, our Washington lobbyist said we should call for a loan of $5. I suggested we should reinforce our policy formula and call for a loan rate of $5.02. We did and it stuck. It was simple, specific (concrete) and credible. The Tropical Fats campaign (mentioned in the book above) helped stem the tide of imported palm oil. A cartoon character called Tropical Fats grabbed attention and helped drive the message home. It was simple and emotional. The “Attack of the Mutant Artificial Christmas Trees” adver-game which was part of an overall marketing campaign to increase the use and sales of farm-grown Christmas trees. It was concrete, emotional and shared stories. Based on the results, our campaign is a case study featured in the 10th edition of the college marketing textbook Consumer Behavior. How “sticky” are the campaigns/messages you create for your association or nonprofit organization?